Viura is a white wine-grape variety most often associated with the Rioja region in Spain. Under its more common name, Macabeo, it is grown widely throughout Spain—particularly in Catalunya for Cava production, and the Languedoc-Roussillon area of France. In the vineyard, the Viura vine undergoes bud break later than many varieties and thus is better protected from the threat of spring frosts. However, it also tends to overproduce. Its bunches can be small and tight, leaving the berries highly susceptible to rot. Quality-minded producers can overcome these issues with meticulous vineyard management, including extreme pruning and early picking. Its berries tend to be large, thick-skinned, relatively low in acidity and somewhat neutral in aroma. The Viura grape is versatile, offering winemakers many options. Styles of Viura wine vary from dry white table wine to sweet wine and sparkling wine. 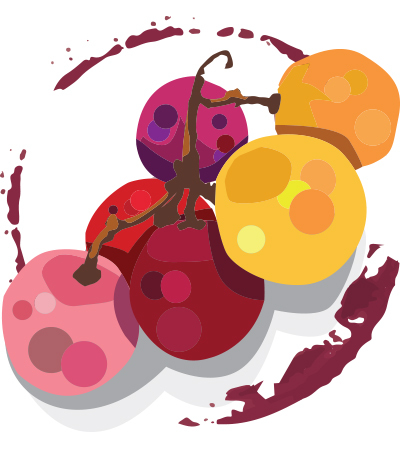 The grape’s relatively neutral flavor profile makes it suitable for blending with other varieties, including more expressive white varieties or sometimes even red varieties. Viura is the key ingredient in white Rioja wine. Rioja Blanco is made from a majority of Viura and may be blended with some other varieties including Malvasia and Garnacha Blanca, and international varieties like Chardonnay and Sauvignon Blanc. Stylistically, white Rioja can range from light and drinkable to richer, full-bodied whites that have spent considerable time in oak. The more youthful style is generally refreshing with flavors of lemon and citrus fruits and floral aromas. Viura responds very well to oak aging and can produce white Rioja wines with considerable potential for aging. Viura may also be blended alongside red grapes like Tempranillo or Garnacha to produce red Rioja. The Viura vine was planted in the Rioja region to replace existing plantings of Garnacha Blanca and Malvasia after the outbreak of phylloxera. The average age of Viura vines is high in Rioja today, so when managed with care, these vines give low yields of high-quality fruit. Known as Macabeo, the grape is used in Catalunya in the production of the traditional method sparkling wine, Cava. Here, it is blended primarily with Parellada and Xarel-lo. Other permitted grapes include Chardonnay, Malvasia, Pinot Noir, Trepat, Garnacha and Monastrell. Macabeo can make up as much as 50 percent of a typical Cava blend, and contributes delicacy and aroma to the wine. Macabeo is widely planted throughout Spain, and produces wines in various styles and at varying levels of quality. Its largest planting is in Castilla-La Mancha, and it is also cultivated in Aragón. In France, known as Maccabéo (or Macabeu), there are considerably plantings throughout the Languedoc-Roussillon region. It contributes to dry whites such as Corbières and Minervois, as well as sweet wines from Maury and Rivesaltes, among others. Other than those already mentioned, the Viura grape has many synonyms. These include Alcanol, Alcanon, Charas Blanc, Forcalla, Macaban, Macabeu, Maccabéo, Maccabeou, Maccabeu, Makkobeo, Malvoisie and Viuna, among many others. No matter what you call it, you’re sure to find a bottle to suit your personal taste. Explore our selection of top-rated wines using the online Buying Guide below.